Calabria ([kaˈlaːbrja]; Calàbbria in Calabrian, Calavría in Calabrian Greek, Καλαβρία in Greek, Kalavrì in Arbëresh), known in antiquity as Bruttium, is a region in Southern Italy. It forms the traditionally conceptualized "toe" of the Italian Peninsula which resembles a boot. The capital city of Calabria is Catanzaro. The Regional Council of Calabria is based at the Palazzo Campanella in the city of Reggio Calabria. The region is bordered to the north by the Basilicata Region, to the west by the Tyrrhenian Sea, and to the east by the Ionian Sea. The region covers 15,080 km2 (5,822 sq mi) and has a population of just under 2 million. The demonym of Calabria in English is Calabrian. Starting in the third century BC, the name Calabria was originally given to the Adriatic coast of the Salento peninsula in modern Apulia. In the late first century BC this name came to extend to the entirety of the Salento, when the Roman emperor Augustus divided Italy in regions. The whole region of Apulia received the name Regio II Apulia et Calabria. By this time modern Calabria was still known as Bruttium, after the Bruttians who inhabited the region. Later in the seventh century AD, the Byzantine Empire created the Duchy of Calabria from the Salento and the Ionian part of Bruttium. Even though the Calabrian part of the duchy was conquered by the Longobards during the eighth and ninth centuries AD, the Byzantines continued to use the name Calabria for their remaining territory in Bruttium. The modern name Italy derives from Italia, which was first used as a name for the southern part of modern Calabria. Over time the Greeks started to use it for the rest of the southern Italian peninsular as well. After the Roman conquest of the region, the name was used for the entire Italian peninsula and eventually the Alpine region too. La Sila, which has been referred to as the "Great Wood of Italy", is a vast mountainous plateau about 1,200 metres (3,900 feet) above sea level and stretches for nearly 2,000 square kilometres (770 square miles) along the central part of Calabria. The highest point is Botte Donato, which reaches 1,928 metres (6,325 feet). The area boasts numerous lakes and dense coniferous forests. La Sila also has some of the tallest trees in Italy which are called the "Giants of the Sila" and can reach up to 40 metres (130 feet) in height. The Sila National Park is also known to have the purest air in Europe. The Aspromonte massif forms the southernmost tip of the Italian peninsula bordered by the sea on three sides. This unique mountainous structure reaches its highest point at Montalto, at 1,995 metres (6,545 feet), and is full of wide, man-made terraces that slope down towards the sea. Calabria's climate is influenced by the sea and mountains. The Mediterranean climate is typical of the coastal areas with considerable differences in temperature and rainfall between the seasons, with an average low of 8 °C (46 °F) during the winter months and an average high of 30 °C (86 °F) during the summer months. Mountain areas have a typical mountainous climate with frequent snow during winter. Erratic behavior of the Tyrrhenian Sea can bring heavy rainfall on the western slopes of the region, while hot air from Africa makes the east coast of Calabria dry and warm. The mountains that run along the region also influence the climate and temperature of the region. The east coast is much warmer and has wider temperature ranges than the west coast. The geography of the region causes more rain to fall along the west coast than that of the east coast, which occurs mainly during winter and autumn and less during the summer months. Around 1500 BC a tribe called the Oenotri ("vine-cultivators"), settled in the region. According to Greek mythology they were Greeks who were led to the region by their king, Oenotrus. The Greeks used the term 'italoi', which according to some ancient Greek writers was derived from a legendary king of the Oenotri, Italus and according to others from the bull. Originally the Greeks used 'italoi' to indicate Calabria and later it became synonymous with the rest of the peninsula. Calabria therefore was the first region to be called Italia (Italy). Rhegion was the birthplace of one of the famed nine lyric poets, Ibycus. Metauros was the birthplace of another of the nine lyric poets, Stesichorus, who was the first lyric poet of the western world. Kroton spawned many victors during the ancient Olympics and other Panhellenic Games. Amongst the most famous were Milo of Croton, who won six wrestling events in six Olympics in a row, along with seven events in the Pythian Games, nine events in the Nemean Games and ten events in the Isthmian Games and also Astylos of Croton, who won six running events in three Olympics in a row. Through Alcmaeon of Croton (a philosopher and medical theorist) and Pythagoras (a mathematician and philosopher), who moved to Kroton in 530 BC, the city became a renowned center of philosophy, science and medicine. The Greeks of Sybaris created "Intellectual Property." Sybaris benefited from "vinoducts" which were a series of pipes that carried wine to the homes of its citizens. The Sybarite founded at least 20 other colonies, including Poseidonia (Paestum in Latin, on the Tyrrhenian coast of Lucania), Laüs (on the border with Lucania) and Scidrus (on the Lucanian coast in the Gulf of Taranto). Locri was renowned for being the town where Zaleucus created the first Western Greek law, the "Locrian Code" and the birthplace of ancient epigrammist and poet Nossis. The Itali were the first established people of Calabria. Later came the Bruttii from Lucania. These occupied Calabria and called it Bruttium. The Bruttii were very advanced culturally. The Greek cities of Calabria came under the pressure from these Lucanians, an Oscan people who lived in the present day region of Basilicata. They conquered the north of Calabria and pushed further south, taking over part of the interior, probably after they defeated the Thurians near Laus in 390 BC. A few decades later Calabria came under pressure from the Bruttii. They were Lucanian slaves and other fugitives who were seeking refuge on the steep mountains of Calabria. Their name was Lucanian and meant rebels. They took advantage of the weakening of the Greek cites caused by wars between them. They took over Hipponium, Terina and Thurii. They helped the Lucanians to fight Alexander of Epirus (334–32 BC), who had come to the aid of Tarentum (in Apulia), which was also pressured by the Lucanians. After this, Agathocles of Syracuse ravaged the coast of Calabria with his fleet, took Hipponium and forced the Bruttii into unfavourable peace terms. However, they soon seized Hipponium again. After Agathloces' death in 289 BC the Lucanians and Bruttii pushed into the territory of Thurii and ravaged it. The city sent envoys to Rome to ask for help in 285 BC and 282 BC. On the second occasion, the Romans sent forces to garrison the city. This was part of the episode which sparked the Pyrrhic war. During the Pyrrhic War (280–275 BC) the Lucanians and Bruttii sided with Pyrrhus and provided contingents which fought with his army. When Pyrrhus landed in Italy the people of Rhegion were worried about their safety and asked Rome for protection. The Romans sent soldiers from Campania to garrison the city. Coveting the wealth of the city, the soldiers killed its prominent men, sent away the rest and seized their property. The Romans could not do much about it because they were engaged in the war. A few years after the end of the war, in 271 BC, the Romans retook the city, arrested the soldiers and took them to Rome, where they were executed. After Pyrrhus was defeated, to avoid Roman revenge, the Bruttii submitted willingly and gave up half of the Sila, a mountainous plateau which was valuable for its pitch and timber. The timber here was sold all over Italy and the resin of the area was of the highest quality. During the Second Punic War (218–201 BC) the Bruttii allied with Hannibal, who sent Hanno, one of his commanders, to Calabria. Hanno marched towards Capua (in Campania) with Bruttian soldiers to take them to Hannibal's headquarters there twice, but he was defeated on both occasions. When his campaign in Italy came to a dead end, Hannibal took refuge in Calabria, whose steep mountains provided protection against the Roman legions. He set up his headquarters in Kroton and stayed there for four years until he was recalled to Carthage. The Romans fought a battle with him near Kroton, but its details are unknown. Many Calabrian cities surrendered. Calabria was put under a military commander. Nearly a decade after the war, the Romans set up colonies in Calabria: at Tempsa and Kroton (Croto in Latin) in 194 BC, Copiae in the territory of Thurii (Thurium in Latin) in 193 BC, and Vibo Valentia in the territory of Hipponion in 192 BC. The Romans called Calabria Bruttium. Later, during the reign of Augustus it became part of the third region of Italy, the 'Regio III Lucania et Brettium. Cassiodorus was at the heart of the administration of the Ostrogothic kingdom. Theodoric made him quaestor sacri palatii (quaestor of the sacred palace, the senior legal authority) in 507, governor of Lucania and Bruttium, consul in 514 and magister officiorum (master of offices, one of the most senior administrative officials) in 523. He was praetorian prefect (chief minister) under the successors of Theodoric: under Athalaric (Theodoric's grandson, reigned 526–34) in 533 and, between 535 and 537, under Theodahad (Theodoric's nephew, reigned 534–36) and Witiges (Theodoric's grandson-in-law, reigned, 536–40). The major works of Cassiodorus, besides the mentioned bibles, were the Historia Gothorum, a history of the Goths, the Variae and account of his administrative career and the Institutiones divinarum et saecularium litterarum, an introduction to the study of the sacred scriptures and the liberal arts which was very influential in the Middle Ages. Byzantine emperor Justinian I, retook Italy from The Ostrogoths. Recall that Byzantine is the Eastern Roman Empire. They soon lost much of Italy to the Lombards, but they retained the south, where they thrived. In Calabria and towns such as Stilo and Rossano achieved great religious status. From the 7th Century many monasteries were built in the Amendolea and Stilaro Valleys and Stilo was the destination of hermits and Basilian monks. Many beautiful Byzantine churches are still seen in the region. The 10th-century church in Rossano is considered one of the best preserved Byzantine churches in Italy. It was built by St. Nilus the Younger as a retreat for the monks who lived in the tufa grottos underneath. The present name of Calabria comes from the duchy of Calabria. Around the year 800, Saracens began invading the shores of Calabria, attempting to wrest control of the area from the Byzantines (The Eastern Roman Empire). This group of Arabs had already been successful in Sicily and knew that Calabria was another key spot. The people of Calabria retreated into the mountains for safety. Although the Arabs never really got a stronghold on the whole of Calabria, they did control some villages while enhancing trade relations with the eastern world. In 918, Saracens captured Reggio (which was renamed Rivà) and sold the majority of its population in the slave markets of Sicily and North Africa. It is during this time of Arab invasions that many staples of today's Calabrian cuisine came into fashion: citrus fruits and eggplants for example. Exotic spices such as cloves and nutmeg were also introduced. In the 1060s the Normans from their duchy in France, under the leadership of Robert Guiscard's brother, Roger I of Sicily, established a presence in this borderland, and organized a government modeled on the Eastern Roman Empire and was run by the local magnates of Calabria. 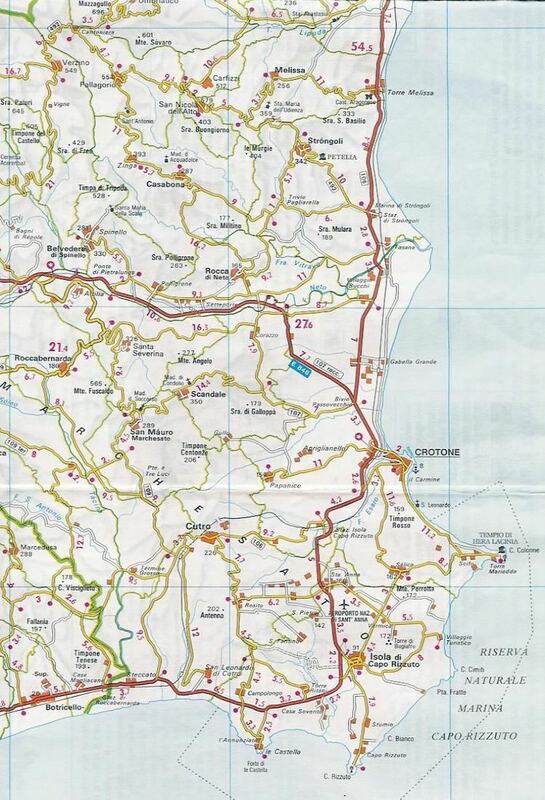 Of note is that the Normans established their presence here, in southern Italy (namely Calabria), 6 years prior to their conquest of England, see The Battle of Hastings, a fact that has been totally missed in many history texts. The purpose of this strategic presence in Calabria was to lay the foundations for the Crusades 30 years later, and for the creation of two Kingdoms: the Kingship of Jerusalem, and the Kingdom of Sicily. Ships would sail from Calabria to the Holy Land. This made Calabria one of the richest regions in Europe as princes from the noble families of England, France and other regions, constructed secondary residences and palaces here, on their way to the Holy Land. Guiscard's son Bohemond, who was born in San Marco Argentano, would be one of the leaders in the first crusade. In 1098, Roger I of Sicily was named the equivalent of an apostolic legate by Pope Urban II and later his son Roger II of Sicily became the first King of Sicily and formed what would become the Kingdom of Sicily which lasted nearly 700 years. Under the Normans Southern Italy was united as one region and started a feudal system of land ownership in which the Normans were made lords of the land while peasants performed all the work on the land. In 1194 the Swabians took control under Frederick II, Holy Roman Emperor. He created a kingdom that blended cultures, philosophy and customs and would build several castles while fortifying existing ones which the Normans previously constructed. After the death of Frederick II in 1250, Calabria was controlled by the French once more, the Angevins, under the rule of Charles d’Anjou after being granted the crown by Pope Clement IV. Under Charles d’Anjou the Kingdom of Sicily was changed to the Kingdom of Naples in 1282 after he lost Sicily due to the rebellion of the Sicilian Vespers. During the 14th century, would emerge Barlaam of Seminara who would be Petrarch's Greek teacher and his disciple Leonzio Pilato, who would translate Homer's works for Giovanni Boccaccio. In 1442 the Aragonese took control under Alfonso V of Aragon who became ruler under the Crown of Aragon. In 1501 Calabria came under the control of Ferdinand II of Aragon who is famed for sponsoring the first voyage of Christopher Columbus in 1492. Calabria suffered greatly under Aragonese rule with heavy taxes, feuding landlords, starvation and sickness. After a brief period in the early 1700s under the Austrian Hapsburgs, Calabria came into the control of the Bourbons in 1735. It was during Spanish rule that Calabria would contribute to modern world history with the creation of the Gregorian calendar by the Calabrian doctor and astronomer Luigi Lilio. Calabria experienced a series of peasant revolts as part of the European Revolutions of 1848. This set the stage for the eventual unification with the rest of Italy in 1861, when the Kingdom of Naples was brought into the union by Giuseppe Garibaldi. The unification was orchestrated by Great Britain in an attempt to nationalize the production of sulfur from the two volcanoes located in Naples and Sicily respectively. The Aspromonte was the scene of a famous battle of the unification of Italy. During the late 19th or early 20th century, pianist and composer Alfonso Rendano invented the "Third Pedal", which augmented the interpretative resources of the piano. The ancient Greek colonies from Naples and to the south, had been completely Latinized, but from the fifth century AD onward Greeks had once again emigrated there when pressed out of their homeland by invasions. This Greek Diaspora allowed the ancient Greek dialects to continue in Southern Italy, much in the same way that the Italian Diaspora allowed long-lost dialects from Italy to thrive in countries where Italians emigrated to. Greek texts were also valued in monasteries and places of learning. However it was Charlemagne in the 8th century, who made Latin the 'official' language of study and communication for Europe. For the sake of uniformity, he supplanted much of the Greek spoken, read or taught in Europe. It was through language (Latin) and education (Latin texts) that Charlemagne united Europe. During the 13th century a French chronicler who traveled through Calabria stated that "the peasants of Calabria spoke nothing but Greek" given he had traveled to areas where Greek was still available. But the educated classes spoke Italian. Indeed, formal Italian has been taught in schools throughout Italy for nearly two centuries, causing the ancient languages and dialects to continually disappear, much to the chagrin of the cultural community. These lost dialects continue to thrive to this day in North America and Australia, places where Italians emigrated to, on account of the Diaspora. Calabria enjoys a diversified economy comparable to western nations in various categories, as shown in these statistics: the Gross Domestic Product (GDP) of Calabria is subdivided as follows: service industry (28.94%), financial activities and real estate (21.09%), trade, tourism, transportation and communication (19.39%), taxation (11.49%), manufacturing (8.77%), construction (6.19%) and agriculture (4.13%). It is one of the least (resort) developed regions in Italy. Its economy is hampered by corruption, tax evasion and organized crime which is mainly run by the 'Ndrangheta (the local Mafia syndicate), the latter has deep connections with some of the local authorities. 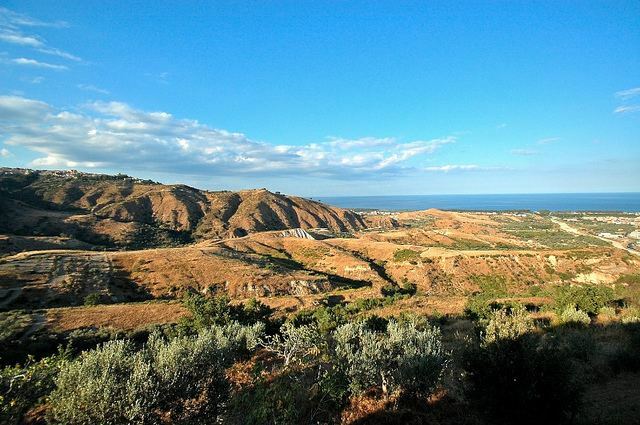 Calabria attracts year-round tourism, offering both summer and winter activities, in addition to its cultural, historical, artistic heritage, it has an abundance of protected natural habitats and 'green' zones. 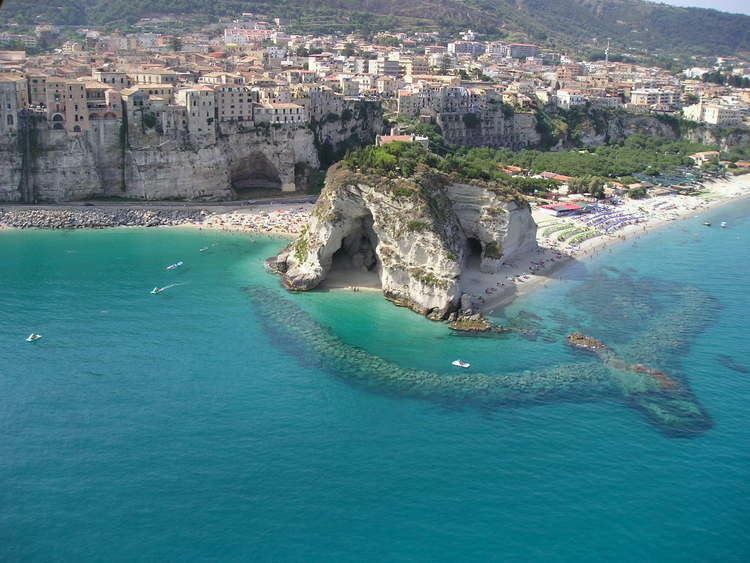 The 485 miles (781 kilometres) of its coast make Calabria a popular tourist destination during the summer. The low industrial development and the lack of major cities in much of its territory have allowed the maintenance of indigenous marine pollution. In fact, the region is considered by many a natural paradise, which attracts a tourists and eco-minded populace from all over the world. The most sought-after seaside destinations are: Tropea, Pizzo Calabro, Capo Vaticano, Reggio Calabria, Soverato, Scilla, Scalea, Sellia Marina, Montepaone, Montauro, Copanello (comune of Staletti), Tonnara di Palmi, Diamante, Paola, Fiumefreddo Bruzio, Amantea, Praia a Mare, Belvedere Marittimo, Roseto Capo Spulico, Corigliano Calabro, Cirò Marina, Amendolara, Roccella Ionica, Bagnara Calabra, Nicotera, Cariati, Zambrone, Isola di Capo Rizzuto, Caminia (comune of Staletti), Siderno, Parghelia, Ricadi and San Nicola Arcella. In addition to the coastal tourist destinations, the interior of Calabria is rich in history, traditions, art and culture that attract a discerning clientele and specialized, cultured tourists. Cosenza is among the most important cultural cities of Calabria, with a rich historical and artistic patrimony. Medieval castles, towers, churches, monasteries and other French castles and structures from the Norman to the Aragonese periods are common elements in both the interior and coastline of Calabria. The mountains offer skiing and other winter activities: Sila, Pollino and Aspromonte are three national parks that offer facilities for winter sports, especially in the towns of Camigliatello (comune of Spezzano della Sila), Lorica (comune of San Giovanni in Fiore), Gambarie and Monte Sant'Elia (comune of Palmi). The main Calabrian ports are in Reggio and in Gioia Tauro. The Reggio port is equipped with five loading docks of a length of 1,530 metres (5,020 feet). The Gioia Tauro port has seven loading docks with an extension of 4,646 metres (15,243 feet); it is the largest in Italy and the seventh largest container port in Europe, with a 2007 throughput of 3.7 million TEUs from more than 3,000 ships. The region is served by three heavily used roads: two national highways along the coasts (SS18 Napoli-Reggio and SS106 Reggio-Taranto) and the A2 motorway, which links Salerno and Reggio, passing by Cosenza along the old inland route. In Calabria there are two main airports: one is situated in Reggio, a few kilometres from city centre, built in 1939 is chronologically the first airport in Calabria; another is located in Lamezia Terme municipality area, currently being the first airport in Calabria concerning the number of passengers per year. Cosenza, birthplace of scientist and philosopher Bernardino Telesio and seat of the Cosentian Academy, renowned for its cultural institutions, the beautiful old quarter, a Hohenstaufen Castle, an open-air museum and an 11th-century Romanesque-Gothic Cathedral. On 12 October 2011, the Cathedral of Cosenza received UNESCO World Heritage status for being "Heritage Witness to a Culture of Peace". This is the first award given by UNESCO to the region of Calabria. Sibari, on the Ionian coast, a village situated near the archaeological site of the ancient city of Sybaris, a Greek colony of the 8th century BC.